But don’t take my word for it. Here are just some of the organizations that oppose this Graham Cassidy Bill: the American Cancer Society, the American Diabetes Association, the American Heart Association, the American Lung Association, the Arthritis Foundation, Cystic Fibrosis, the ALS Association, the March of Dimes, Multiple Sclerosis Society, Children’s Hospital of LA. Basically, any group you’ve ever given money to thinks this is a bad idea. Do you trust them, or do you trust him? OK? So if this bill isn’t good enough for you, call your congressperson. That’s the number, go to your congressperson — whoever he or she is — (202) 224-3121. You have to do this; you can’t just click like on this video. Tell him this bill doesn’t pass your test. 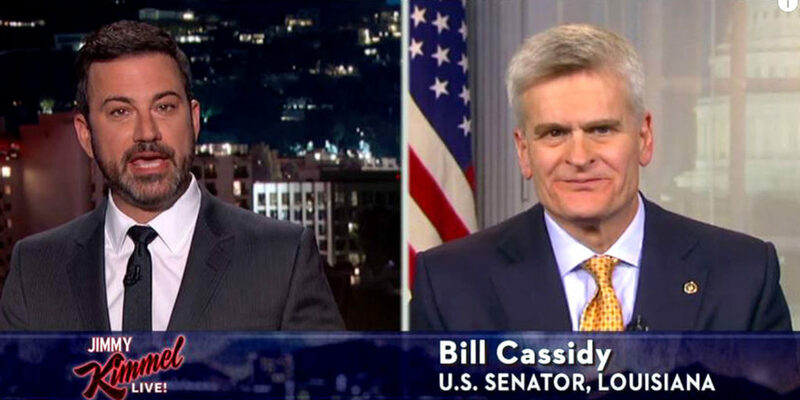 And Senator Cassidy, you were on my show, you seemed like you were a decent guy. But here’s the thing. Nobody outside of your buddies in Congress wants this bill. Only 12% of Americans supported the last one, and this one is worse. Right now there’s a bipartisan group of senators working to approve the healthcare system we have. We want quality, affordable healthcare. Dozens of other countries figured it out. So instead of jamming this horrible bill down our throats, go pitch in and be a part of that. I’m sure they could use a guy with your medical background. And if not, stop using my name. Because I don’t want my name on it. There’s a new Jimmy Kimmel test for you. It’s called the lie detector test. You’re welcome to stop by the studio and take it any time. Maybe if the Democrats had done as good a job selling the Affordable Care Act in the beginning, instead of going on the defensive, they wouldn’t be in this position. Fortunately Bernie Sanders is speaking out forcibly about an even more comprehensive alternative, Medicare for All.